Meet with your child’s other parent to discuss your parenting plan. Get a notepad and pencil, and write down the decisions that are made. Be specific whenever necessary so that there are no arguments once the plan comes into fruition. Make sure that both parties are satisfied with the decisions, but also recognize that there may be concerns when implementing the plan and that both parties can request a change if necessary. Establish custody of the child. 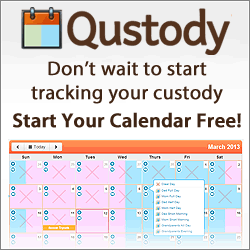 Decide who will have legal custody of your child. Typically both parents have legal custody so that both parents make decisions regarding education, medical needs and other important issues. Settle on physical custody of the child. In some cases, 1 parent has custody of the child more days during the week than the other, or more months during the year if the parents live a distance away. Another option, if the parents live close by, is to share physical custody. In this case, the parents split the week or take the child on alternating weeks. Select a physical custody agreement that works for the child, especially when it comes to school, and then create a calendar that lays out the plan. Make arrangements regarding holidays, school breaks and vacations. Determine how you will deal with holidays, especially Christmas, Easter and other important family holidays. Some parents split the day while others take alternate years. Add your decision to the calendar. Lay out the details regarding financial responsibilities. Establish a support for the child if 1 parent has physical custody. Determine how other expenses will be dealt with, such as clothing, uninsured medical expenses and co-pays. Determine who will claim the child when filing taxes-�usually this is the non-custodial parent. Make a list of all the expenses that child support does not cover and decide who pays what. Decide on the education of your child in your plan for parenting. Whether you both agree to public schooling, private schooling or homeschooling, determine which type of schooling you want for your children. Note also how you will be dealing with parent teacher conferences. You can take turns attending, or both parents can attend together. Another option would be to make arrangements with the teacher to attend all the conferences separately. Make a note in your parenting strategy regarding receiving information and school grades from the school. Again, you can arrange for 1 person to receive everything and make copies for the other, or you can ask the school to send you both the same information. Consider school events. Decide who will be attending these. You can choose to take turns or have 1 person attend all the events. Make a decision that you are both happy with. Include instructions regarding medical care in your plan to parent. Decide who will attend appointments and what the protocol should be in the case of emergencies. If both you and the other parent work, you may have to take turns. The other option is to establish responsibility depending on who has custody of the child at the time. Agree on how you will approach religion and cultural heritage. If you and the other parent have different religions and heritages, decide if you want to teach your child both. If 1 parent practices their religion more than the other, you may decide to teach your child about that 1 religion. Make a decision that you can both agree on. Settle on childcare and right of first refusal. Determine whether both parents will use the same babysitter. Also, make a rule about considering the other parent to watch your child before calling in a babysitter. Finalize decisions on daily situations and parental cooperation. Decide on discipline techniques, treating and discussing the other parent in front of child, expectations of child, child’s routines and chores, participating with child, developing family relationships and attending activities. You and the other parent must agree to be consistent in all these areas. Type up the plan. You and the other parent should read it over. Sign the paperwork in front of a witness or notary public. Review the parenting plan with the other parent in 6 months Take the time to meet and ensure that the parenting plan is working, is effective and that both parents are satisfied. If there is a concern, discuss it and determine a way in which a change can be made so that both parents are pleased. Don’t forget to confirm contact with parents. Determine whether the child can call the other parent, and when. Decide if the parent without custody at the time can call or text the child and when.